One of the great mysteries of physics is why our Universe appears to be made entirely of ordinary matter when matter and antimatter are understood to have been created in equal amounts at the time of the Big Bang. The ability to create and study antimatter in conditions similar to those of the early Universe has just achieved a milestone by the STAR experiment at the Relativistic Heavy Ion Collider (RHIC), at DOE’s Brookhaven National Laboratory in New York detecting the antimatter partner of the helium nucleus: antihelium-4. This new particle, also known as the anti-alpha, is the heaviest antinucleus ever detected from a collision in the (RHIC). The new record will likely stand for a long time, the scientists say, because the next weightier antimatter nucleus that does not undergo radioactive decay is predicted to be a million times more rare — and out of reach of today's technology. Knowing the production rate of these antinuclei is important to a wide range of scientific disciplines, including searches for new phenomena in the cosmos. For example, it ties in with the scientific goals of an experiment known as the Alpha Magnetic Spectrometer (AMS), which will be delivered to the International Space Station via one of the last space shuttle missions, currently scheduled for launch in late April 2011 to search for antimatter in space. 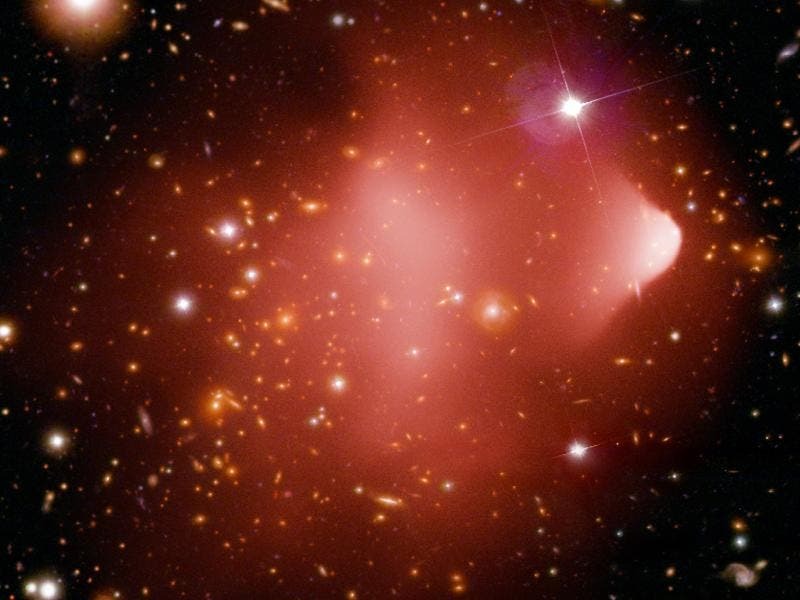 Image top of page: The Bullet Cluster has been used to search for the presence of antimatter leftover from the very early universe. Antimatter is made up of elementary particles that have the same masses as their corresponding matter counterparts — protons, neutrons and electrons — but the opposite charges and magnetic properties. via NASA – Image Credit: X-ray: NASA/CXC/CfA/M.Markevitch et al. Optical: NASA/STScI; Magellan/U.Arizona/D.Clowe et al.